Hi, friends! Jessica here, again, and I am kinda super duper excited about today’s project I’ve created with help from my friends at JOANN! With Valentine’s Day right around the corner, I wanted to create something that was quick and easy to put together and was something you could use for years to come! I love decorating my home for each new season and holiday and being able to find any excuse to add pink to my home makes me happy. This is a personal blog. All editorial content and projects are intellectual property of Jessica Carey, designer of The Hook Nook. This post was sponsored by JOANN but all ideas and opinions are my own. 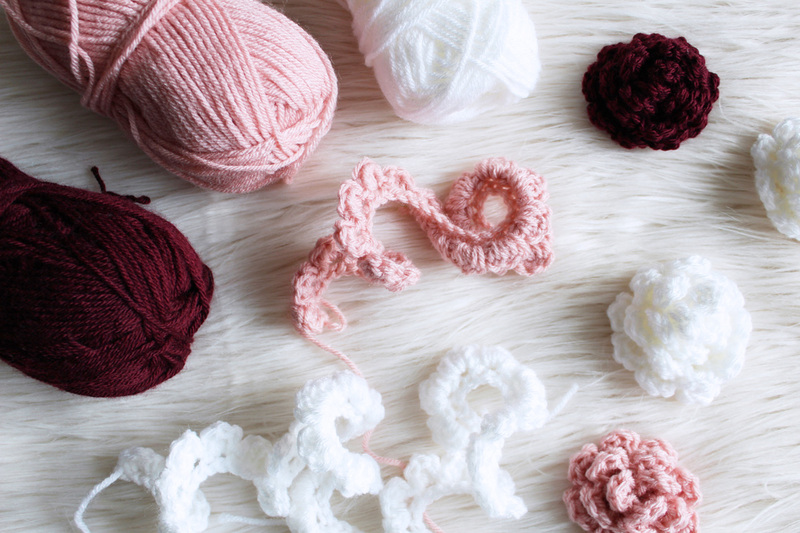 I had so much fun creating this Crochet Floral Bouquet and I hope you will make one too! Let’s get started! (1) Lion Brand Vanna’s Choice Yarn, Pink : worsted wt, 4. 100% acrylic. (1) Lion Brand Vanna’s Choice Yarn, White : worsted wt 4, 100% acrylic. (1) Lion Brand Vanna’s Choice Yarn, Burgundy : worsted wt4, 100% acrylic. Note: I created two different sizes for my bouquet. The sizes are hardly noticeable, but I like the subtle dimension it gives, even if I’m the only one who sees it. ;) You can find how to create both sizes below. CH 1, turn. [Sl St, 3 DC, Sl St] in CH-1 sp. Repeat in each CH-1 sp across. Note: Your work will begin to “curl” or “spiral” - this is exactly what it should do! Don’t worry! Finish off, leaving long 7-8” tail. We will use this tail to assemble the flower. Weave in other end. 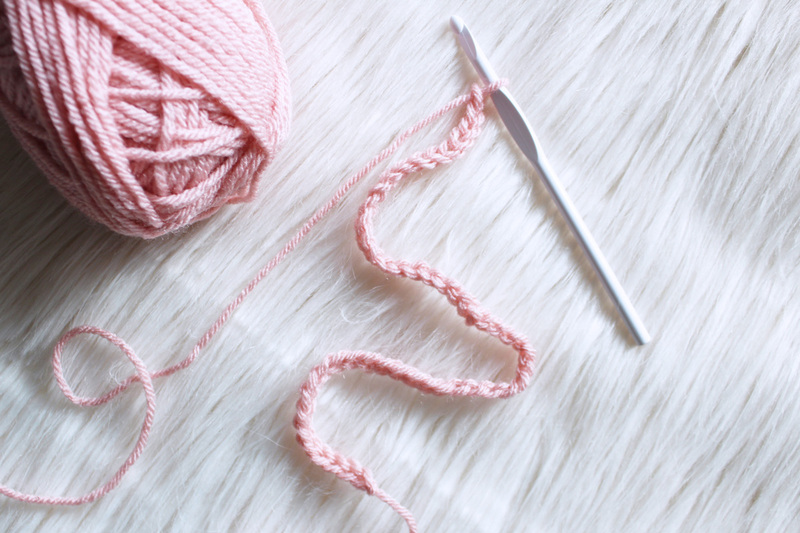 Attach yarn needle to long tail. 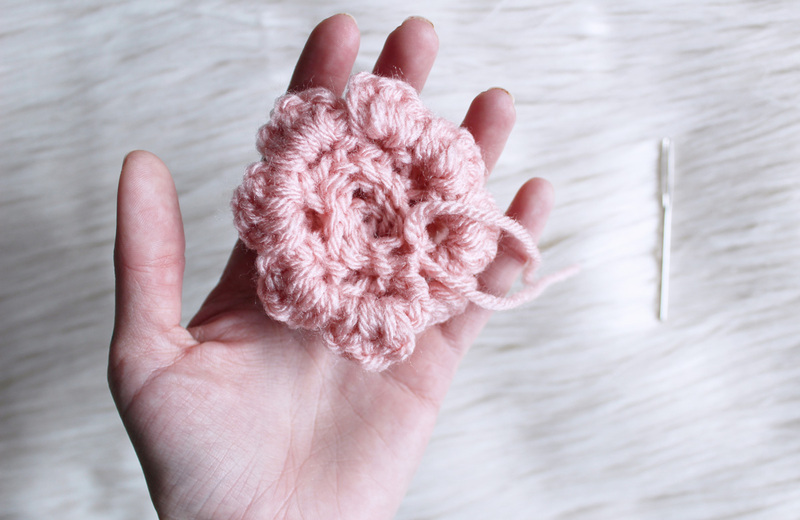 Grab one end of the flower “petals” and begin wrapping it around itself in a circle to create a flower-shape. 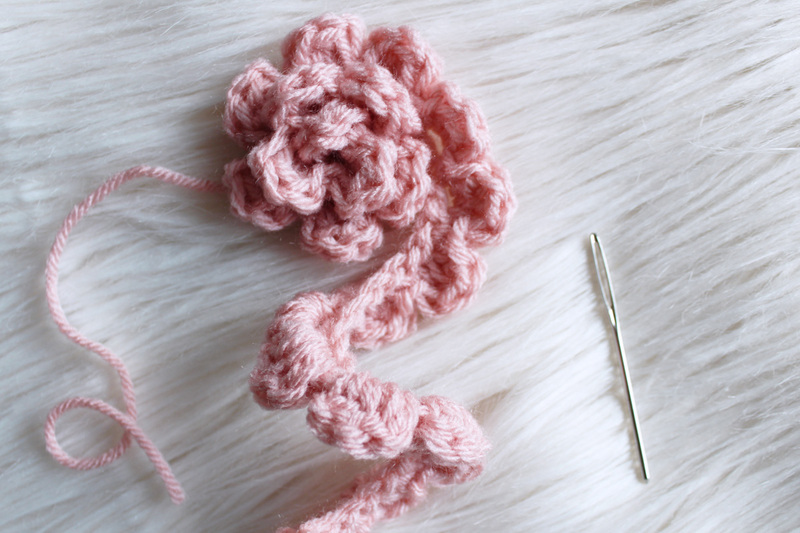 Once shaped, use the yarn needle attached to the long tail to sew the flower to secure the shape. Simply weave in the tail through the CH spaces on the underside, making sure to get each “round” so nothing pops out later. 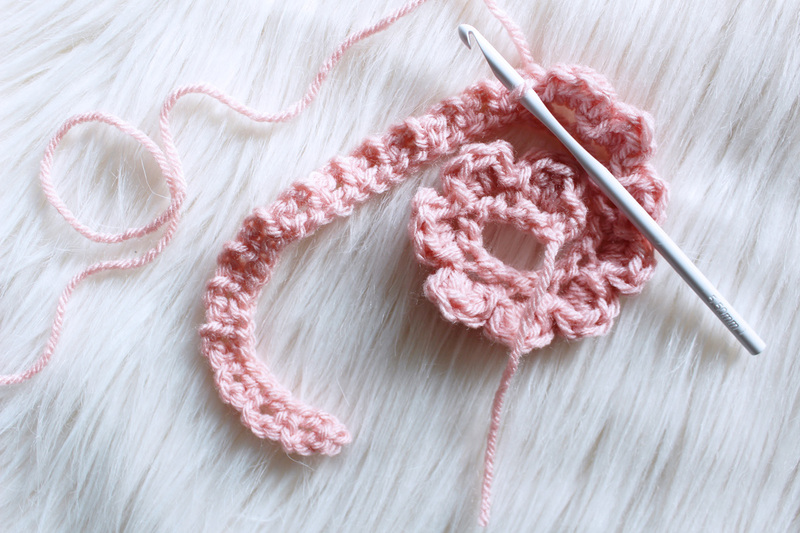 Create knot and weave in end. Note: Be sure not to pull the tail too tight otherwise it will change the shape! **OPTIONAL - I chose to cut small circles out of green felt and hot glued them to the back side of the flowers to hide the “mess”. Having the flat back also helps when adhering to your florals. 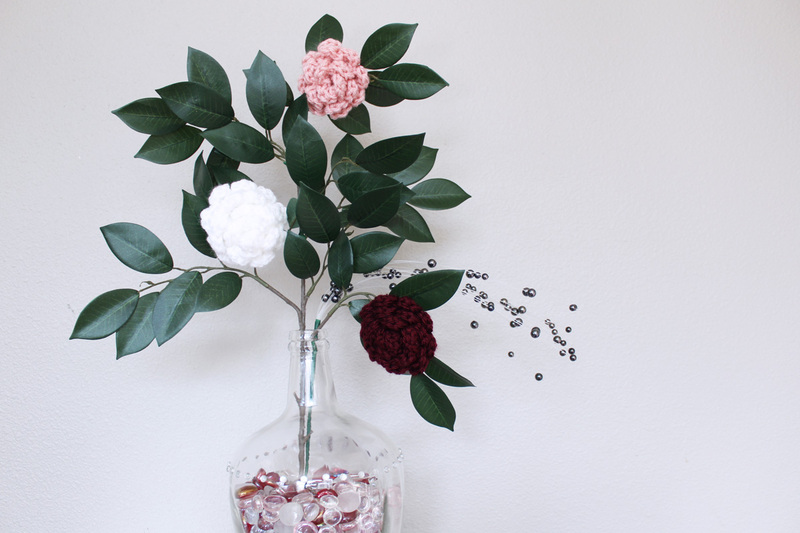 Using your hot glue gun and hot glue, adhere your crochet flowers onto your florals. I chose a simple flat green leaf stem for the flowers to attach to as well as a fun beaded one just to add some more personality! 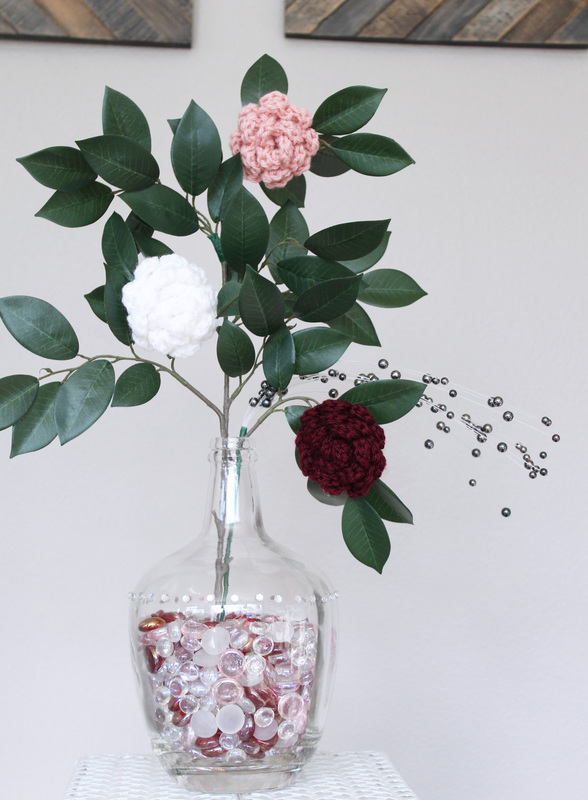 After placing your glass beads into your vase, place your crochet floral stems and any other additional stems you may have chosen, andddd…. VOILA! 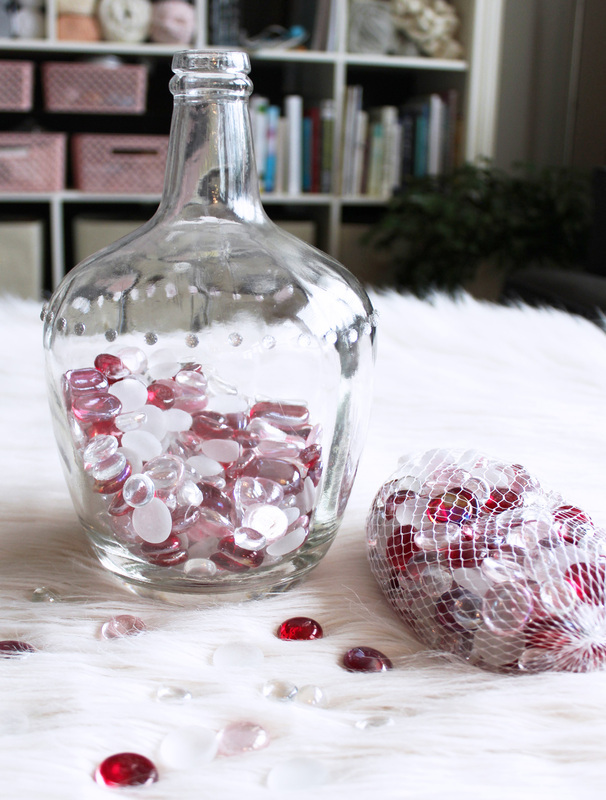 I really had a lot of fun creating this fun and easy project to add to my holiday decor, but I think I may just leave this one up ALL the time. I mean, as long as my husband doesn’t care, that’s all that really matters. Ha! Thank you to my friends at JOANN for helping me get my hands on all of the materials needed to explore my creativity! Happy making, my friends!! I hope you all have a WONDERFUL rest of your week!